Running a smelt with lower volumes of air. 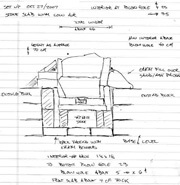 Build the furnace using a stone slab construction method. Diameter: 25 cm (front to back) x 35 cm (side to side) Stack above Tuyure: 40 cm (minimum) Tuyure Diameter: 1" (2.6 cm) I.D. The stone slab construction was an extension of the Thanksgiving smelt, which had the front section of the smelter made of stone. It also was a return to our very first group smelt (in spring 2002). The material on hand were relatively thin and randomly shaped pieces of mica schist. Despite some concerns about how water can create some potentially explosive effects on this stone when it is subjected to high temperatures, the material once again stood up extremely well. The shape and proportions of the furnace was largely the result of the irregular shapes we had on hand. The overall height of the structure was also limited by the amount of stone available. Ken undertook most of the construction work, fitting the various slabs together as best he could. Considerable attention was focussed on the lower section and the front above tuyere level. The gaps between the slabs was filled with prepared clay cobb and sealed using wet waste clay. Once again the advantages of the straw fill in the cobb was obvious over the course of the smelt. The finished smelter actually most closely resembles the construction suggested for L'Anse aux Meadows with the exception of the type of stone. The finished furnace was deemed to be the ugliest one we had ever constructed! A large tap arch was blocked out by a nicely shaped stone. It was decided to use a bottom extraction method for this smelt. This resulted in a rather large lower section to the furnace, so a base level of charcoal fines was established. With the height of the tuyere elevated above ground level, but the total height of the furnace about the standard, the effective shaft height above the tuyere was reduced. Another wrinkle on the construction was a ledge of stone from the piece used to span over the tap arch. The tuyere was positioned so that it came just to the inner lip of this stone. In effect this placed the tip of the tuyere about 6 - 7 cm in from the line of the smelter interior wall. It was expected that the lower air volumes would greatly extend the time required for the smelt. Although better intentions were made, the pre-heat was started at our normal 9 AM, with primary smelt sequence started a bit after 10 AM. As normal, pre-heat was using wood splints, passive at the start and for the last 15 minutes or so using gentle air. For this smelt, Neil was the iron master, with Ken working as lead hand. Darrell started the recording, with Ron Ross managing the latter half of this task. It was decided to seed the smelt using the poorer quality Virginia Rock ore gathered last year by Darrel and Vandy. Although this material has proved to have too low an iron content, it was hoped that it would compensate for the lack of slag seen with earlier uses of the hematite grit. It was also expected that considerably less slag would be available inside this smelt with the use of stone instead of clay for the wall materials. In the end it proved we were overly conservative, and production of a suitable volume of slag would prove a problem. With the lower consumption rates expected as a result of the lower air volume, it was also decided to limit the total amount of ore added. It was expected that this would only allow for the formation of a small bloom. The air volume used over this smelt was about 400 litres per minute - compared to the usual rate employed in past successful smelts at closer to 800 plus LPM. As was expected, the lower air greatly extended the time between additions of the standard 10 litre charcoal measure, which increased from a normal 8 minute average to closer to 22 minutes. The construction of the furnace had reduced the height of the reaction column from our normal 55 - 60 cm to closer to 40 cm. Still the theoretical 'drop time' for any individual particle of ore had been extended from a normal 25 - 30 minutes to double that - closer to 60 - 70 minutes. This was expected to produce problems in carbon control with the fine particles of the hematite grit. A secondary concern was the amount of penetration of air into the body of the smelter, again an expected effect of the lower volumes. Several times during the smelt, the depth of the heated zone was measured at tuyere level, This was done by the simple process of inserting a 3/8 diameter mild steel rod held horizontal to the ground through the blow hole. After about two minutes the rod was pulled out, and the colour of the rod used as a simple measure of heat. The rear 1/3 to 1/4 of the rod did not show any visible colour, indicating that the area of the furnace furthest from the tuyere had to be below 600 C. It was hoped that additions of ore would none the less drift towards the ignition area above the tuyere. Generally the slower consumption rate lead to a much less frantic smelt sequence. It was obvious fairly early on that less slag was being produced. Although the furnace had been constructed as an 'incontinent' type, little slag was ever observed flowing from the slag bowl (even after the tap arch was opened later in the smelt). Neil undertook the extraction, and was able to grab almost the entire slag mass as one piece. There was little liquid present, and not much remained inside the furnace (generally both bad signs). Kevin Jarbeau and Ken worked the surface quite lightly with the hammers. Almost immediately, the majority of the mass split away, obviously only slag. The material remaining was extremely granular and poorly sintered. Even under gentle strokes of the large hammers, it quickly broke into a number of golf ball size pieces. Although we had hoped for a least a small well consolidated bloom, it was clear our product was too fragile to work. Although the general opinion on the day was that the product of the smelt was in fact a high carbon cast iron, I personally had some doubts. In past uses of the hematite grit as an ore material, the results even with high air volumes always had a granular texture and a high carbon content. On Tuesday I attempted to work one of the denser fragments inside the coal forge. Knowing how fragile this granular material would be, the roughly goose egg piece was brought close to a welding heat and very gently worked with a wooden mallet. Even under the lightest of strokes it was not possible to do much more than just push the grains a bit closer together. I was not able to actually forge the material into any kind of solid piece. The end result was just a larger pile of smaller fragments. One piece (about 3 cm wide and about .5 thick) was compressed enough to have a noticeably flat surface, this was taken to the grinder for a spark test. The sparks produced were like those seen from a piece of high carbon tool steel (in the range of 1 % plus carbon content). It may prove possible to forge weld the fragments between two other slabs, but I was unable to work the material as it exists at this point. The construction method using stone slabs with clay cobb sealing the joints is certainly viable. It is unlikely that the mica schist material would withstand a second firing without heavy replacement of the material at the normal hot zone above the tuyere. The stone in this area exhibits both considerable errosion and also a thick deposit of slag. Both of these effects should be clearly visible in archaeological remains of this type. The use of lower volume air requires considerable further experimentation to develop a truly successful sequence. As has been clearly demonstrated with both our earlier smelts and those of other experimenters - there is a (poorly understood) relationship between ore type and purity, smelter material and design, fuel preparation, and physical sequence. Those attempting smelts with low air volumes have great difficulty (if able at all) in producing large and well consolidated blooms. In retrospect, it is most likely that both the content and the fine particle size of the hematite grit renders it quite unsuitable for use in any kind of low slag producing smelter. The extremely low silica content of the ore means that the formation of slag must come almost exclusively from the melting of the smelter walls. Although good results have been attained with this material in past smelts, this has always been inside those furnaces that have suffered considerable internal erosion.